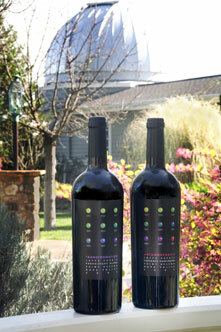 Store - Jaffe Estate - Napa Valley estate-grown Cabernet Sauvignon, Metamorphosis, and proprietary blend, Transformation. Who’d have guessed that a person could spend so much time studying the heavens and still keep their feet firmly planted in the soil? For Gary and Pam Jaffe, spotting new stars in the Orion Nebula, or counting Saturn’s rings brings a fresh perspective on bud break along the vines, or the bright taste of young wine in the mouth. With its silver-domed observatory perched on the edge of the vineyard, Jaffe Estate marries the agricultural and the celestial, the earth and the sky, to create transcendent wines. Two of Gary’s enduring passions come together here: a lifelong fascination with astronomy and a love for the Napa Valley that began decades ago. Drawn first by the striking beauty of the Valley and surrounding hills, it was the collaborative approach to growing wine grapes that compelled him to stay. He had never before encountered an industry in which competitors routinely helped one another succeed. The more time he spent here, the clearer it became that Napa’s winemakers are committed to maintaining its reputation as the premiere viticultural region in the country. Collective success takes precedence over individual gain. Gary embraced the “we’re all in this together” spirit of the place, the mutual effort it takes to make some of the world’s finest wines. Now that the Jaffes live in the Valley year-round, they are able to fully participate while giving back to the community. Pam created the popular Holiday Home Tour as a fund-raiser for the St. Helena elementary school, and both she and Gary are active in a variety of charitable organizations. Then there are the groups of local school kids who visit the observatory for up-close views of star clusters, planets and other celestial sights. The Jaffes encourage every one of them to come back as often as they like. Most do--usually with an excited parent in tow. 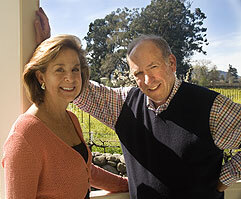 Pam exemplifies the ethos of both the Jaffe Estate and the larger Napa Valley. For her, this is the ideal place to raise a family, to commune joyfully with the natural world, to live life abundantly. Pam spent her young adulthood touring Asia and Africa. She lived on the retired Navy ship her documentary filmmaker father outfitted to accommodate his wife and children, along with a battery of cousins, friends, deck hands, tutors and film crew. And yet, for a woman who has traveled extensively--even to the stars--there is no better place than this patch of earth she and Gary tend as a loving legacy for their children.